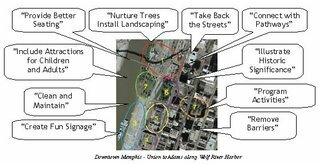 "A fresh look at the Memphis Riverfront," a placemaking exercise led by the Project for Public Spaces (PPS), brought Memphians together to gain insight and brainstorm about ways to make seven public spaces along the riverfront more celebrated, more enjoyed, and more valued. A report on the suggestions from the workshop is now available. Click here to read/download a copy. (5 MB, Adobe Acrobat). The report is divided into two sections. The first compiles the ideas from the people in our community – what they saw and their comments. In the second section, PPS drew from their experience and the citizen comments to make short and long-term suggestions. 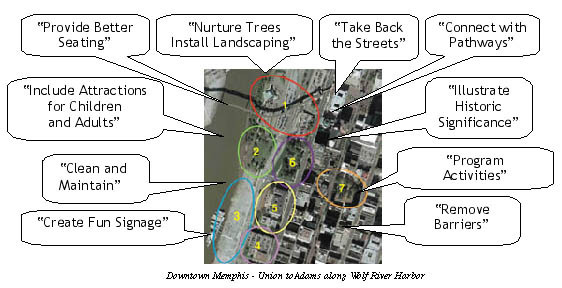 The March 2007 placemaking workshop was presented by Friends for Our Riverfront, Rhodes College Urban Studies Program, University of Memphis Planning and Zoning Institute, and Memphis Heritage. It was sponsored by the Crawford-Howard Foundation. We hope you will enjoy this report and invite your suggestions and involvement. Click here to learn more about the Project for Public Spaces.